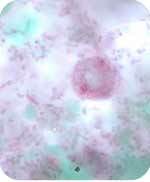 Dientamoeba fragilis trophozoites is a single celled intestinal parasite that can cause symptoms in some people and none in others. Infection by this parasite is often due to antibiotic use which upsets the balance of the normal flora that resides in the intestines and this parasite is often found in the stools of people suffering from irritable bowel syndrome (IBS). A huge percentage of the population is diagnosed with IBS without actually being diagnosed with a specific disease. IBS symptoms can be caused by the body’s reaction to a number of irritants in the diet including lactose and gluten intolerance or microbial infections by intestinal parasites or yeast infection such as Candida albicans. IBS can also be caused by bacterial infection or by combinations of all these factors. Someone who has an undiagnosed food allergy or intolerance and suffers from a chronic yeast infection of the intestines is much more vulnerable to infection by Dientamoeba fragilis. Dientamoeba fragilis is extremely fragile (hence its name fragilis) and dies off outside of the body almost immediately and then is quickly broken down by bacteria and enzymes and decomposes but immediate contact with the faeces of someone who is infected can be contagious. As with many other parasites, it is mistakenly thought that infection of this parasite will only happen due to a visit to the tropics. However, it is also possible to get infected anywhere such as when using the toilet or other ways that involve coming into contact with the faeces of people who are the carriers of parasites. The risk of infection is greater for professionals who come into contact with faeces such as those in involved in nursing, care of small children, the elderly and psychiatric patients, plumbers, recyclers or staff in airports and on ships. The increase in travel has made this parasite spread far and wide and often several people within a family are infected at the same time. Pigs and waste water can be carriers of this parasite. This parasite may also be spread in pinworms (Enterobius vermicularis) eggs. Several organisms, including Dientamoeba fragilis, have become resistant to certain medications provided by doctors but can be weakened and eliminated through natural foods such as garlic and others below. Symptoms: Abdominal pain (especially in children), abdominal distension and bloating, alternating diarrhoea and constipation, fatigue, flatulence, gastritis, hair loss, irritable bowel syndrome, nutrient deficiencies, pain in joints, skin irritations, stomach cramps, vomiting and weight loss. Berberine is extracted from the amur cork tree, . Uva ursi and goldenseal are often used for similar medicinal purposes because both herbs contain the chemical berberine which is known to kill this parasite. NOTE: There may be an interaction between berberine and many prescription medications, including metformin, and it should not be used by pregnant or breastfeeding women due to potential for adverse effects in the newborn. Excess berberine can cause brain, kidney and liver problems and should never be taken as a supplement on its own. It has been shown to cause liver tumours in rats and people with heart problems can be induced by berberine to have arrhythmia attacks. Only use under advice from a health professional. Make herbal teas by steeping chopped leaves or grinding seeds into hot water for 15 minutes then strain and add one teaspoon of pure unblended honey and the freshly squeezed juice and zest of half a lemon and drink three times a day. Herbs, such as anise, green tea and liquorice root, should be included in your herbal remedy of choice for additional anti-parasitic abilities and lemon juice and honey can be added for more health benefits and taste. Black walnut (Juglans nigra) hulls contain a substance which helps the body eliminate these parasites. Chinese rhubarb root (Rheum palmatum, Rheum rhaponticum, R. palmatum, Rhizoma rhe): Mix one teaspoon of rhubarb powder to one cup of water. Then, bring to boil and simmer at a reduced heat for 10 minutes. Add a little pure unblended honey to sweeten. Coriander (Coriandrum sativum, cilantro) has many powerful anti-parasiotic compounds and is often added to laxative formulas to help prevent cramping. Elecampane (Lula helenium, horse-heal or marchalan) is a digestive stimulant and remedy for upset stomach due to a chemical called alantolactone that can expel worms and parasites from the digestive tract. Taken before a meal, the root decoction also has a bitter component called helenin which promotes digestion, improves vitamin and mineral absorption and stimulates the appetite. Garlic: Chop finely, or crush, four cloves of garlic and allow to stand for ten minutes to enable the chemical reaction to take place that produces the anti-parasitic compound. Then mix with one glass of liquid (water, juice or milk) and drink daily for three weeks. Also add chopped garlic to any meals such as rice and vegetable dishes or to plain yoghurt as a dip. Grapefruit seed extract has been shown to be very effective against this parasite. Oregano oil (Origanum compactum): Take one to two drops under the tongue or with juice three times daily. A cup of tea made by steeping the leaves and roots of the oregano herb for ten minutes may also be drunk three times a day. Add lemon juice and a teaspoon of honey for additional benefits. Wormwood (Artemisia annua): Named for its ability to expel parasites, wormwood is known world wide for its strong killing ability as it contains the potent chemicals thujone and isothujone, which are the primary components that kill parasites. Wormwood also contains santonin, an effective remedy for parasitic diseases and sesquiterpene lactones, which work similarly to peroxide by weakening the parasites membranes therefore killing them. It can be taken as a tea, a liquid extract or as a capsule. To make a medicinal tea, soak a handful of sweet wormwood leaves in hot water for 20 minutes. Then wring out the juice and drink it all. Do not take the pure oil as it is considered to be toxic.